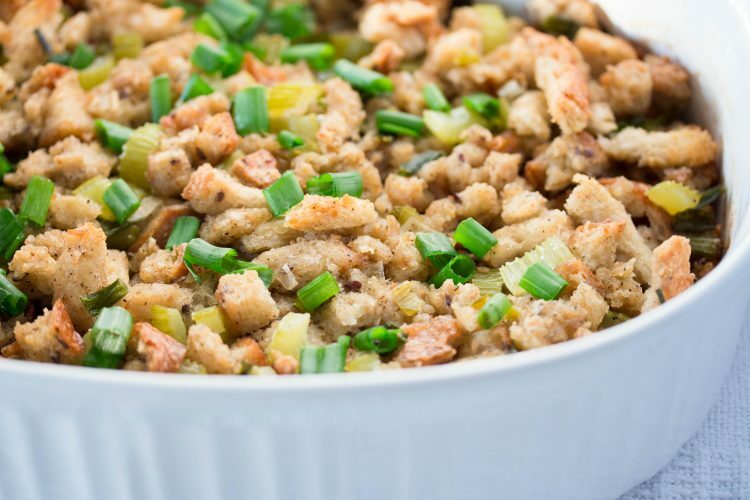 This savory classic stuffing recipe will be the perfect compliment to your Thanksgiving Turkey. 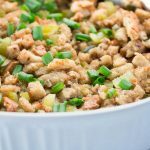 The combination of just a few seasonings creates a flavorful, easy to prepare bread stuffing recipe. Full disclosure here: I have not always been the biggest fan of stuffing at Thanksgiving. It’s a staple though. Stuffing must accompany turkey at Thanksgiving. It’s a tradition! SO after several years of experimenting with stuffing, I discovered I like mine a little more crispy rather than moist and soft. In order to create more of a crunchy texture, I bake my stuffing instead of stuffing the turkey with my bread stuffing. Also, it’s pretty simple to adjust the texture of this recipe by adjusting how long you bake the stuffing uncovered. For softer more moist stuffing, bake uncovered for a shorter amount of time. For more crisp, crunchy stuffing, bake uncovered for a little longer time. No worries… I provide exact times and instructions in the recipe. When I was hunting for fresh bread crumbs, I asked one of the bakery employees at my local grocery store for help with my search. She was so kind to walk me directly over to the bakery and instruct the lady behind the counter to slice a fresh loaf of bread two ways! I had my choice of whole wheat, white, sour dough, and asiago loaves. The kind lady grabbed my whole wheat loaf, sliced that baby two ways, and made my fresh bread cubes! I’m excited to try the sour dough and asiago bread next. Most traditional stuffing recipes instruct you to use stale bread or to dry or lightly toast your bread prior to preparing. I really enjoyed the texture from using fresh, non-stale bread. I could not stop stealing tastes once it was fresh out of the oven. I had to slap my own hand in order to stop myself from completely devouring before I had even taken pictures! Oooh, the crispy deliciousness was too much for me to resist, but I did hold off long enough to get some photos capturing its scrumptiousness. 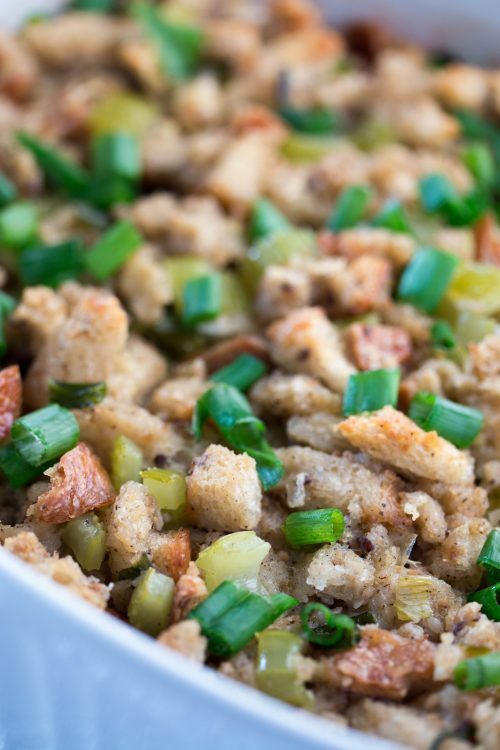 I hope you enjoy this simple classical bread stuffing recipe as much as I did! Have a very safe and Happy Thanksgiving! 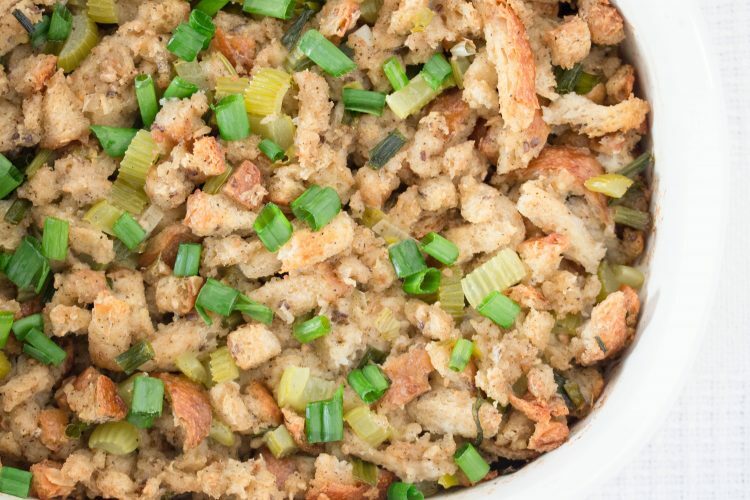 This savory and well-seasoned bread stuffing will perfectly compliment your Thanksgiving Turkey. In a large pan over medium heat, melt butter. Add celery, scallion whites, garlic, thyme, salt, and pepper. Cook until celery and onion are soft (3 to 5 minutes). Add chicken stock and stir until combined. Remove from heat. In a large bowl, add bread cubes and scallions greens. Toss to combine well. Pour butter/vegetable mixture over bread and once again toss to coat. Allow bread crumbs to sit for 5 minutes to allowed the liquid to absorb into the bread. In lightly greased 11 x 7 x 2 inches baking dish, evenly spoon stuffing mixture into the pan. Baked covered for 30 minutes. Uncover and continue to bake for 15 to 25 minutes until stuffing reaches desired brown color and crispiness (I like mine more crispy and baked mine uncovered for the full additional 25 minutes). If you would like to stuff the turkey with your stuffing, go ahead and omit all or at least 1/2 cup of the chicken stock/turkey broth from the recipe. The juices from your turkey will add more liquid to the stuffing as it cooks.